We all spend a lot of time and effort to make our images as sharp as possible. We invest money in equipment to capture the sharpest images possible. We also use a variety of shooting techniques to make sure that our pictures are crisp. Even after doing all that, however, most of the time our images aren't as sharp as we would like. This article is going to show you how to fix that using Lightroom. Tailoring the sharpening to the way you will display the image. Doing these three things actually involves different steps and takes place in different parts of Lightroom. Don't worry though, because performing the sharpening in steps does not add complication to the process. It actually makes it simpler because you will just be going one thing at a time. The first step in the sharpening process is called Input Sharpening. You may be aware that, while RAW files offer many advantages over JPEGs (more data, more colors, greater dynamic range, etc. ), one issue with RAW files is that images come out of the camera looking a little bit fuzzier than JPEGs. That is because a certain amount of sharpening is applied to the photo when it is converted to a JPEG. In this first step, therefore, you will add some sharpening to the RAW file to make it look at least as good as the JPEG. As you do that, you will also apply a base level of sharpness to the entire image. After that, you can get creative. The second step is called Creative Sharpening. In the second step, you determine which parts of the image you want to stand out and appear the sharpest, and you will add sharpening to those parts. Since we will only be adding sharpening to portions of the image, you will use Lightroom's Adjustment Brush to add this sharpening. The final level of sharpening depending on the final output is called Output Sharpening. In this final step, you will add some sharpening to tailor the image to the way you display it. Prints require a different level of sharpening than images displayed online. I gave this urban photo a base level of Input Sharpening by increasing the Sharpness Amount to 55, Clarity to 20, and Dehaze to 10. Then I used the Adjustment Brush to paint in additional sharpness on the fountain and buildings using these settings: Contrast +19, Clarity +32, and Sharpness +50. First we will do the Input Sharpening. Start by bringing your photo into the Lightroom Develop module. If you start with a RAW file, Lightroom will default to increasing the amount of sharpness to 25. Lightroom will not automatically add any sharpness to a JPEG since that is already applied during the conversion process. The Input Sharpening step is often just a rote application of sharpness using the Amount slider in Lightroom's Develop module. The Amount slider controls intensity of the sharpness. Within the Develop module, just scroll down to the Amount slider and increase it to around 50. Quite often, all you need to do for the Input Sharpening step of the sharpening process is increase the Amount slider to around 50. In many cases, a simple increase of the Amount slider to 50 is all you need to do to apply image sharpening. As shown below though, there are three additional sharpness sliders that let you control the process further. Radius– The radius is the size of the sharpening area around the edges you are sharpening. The default value is 1, and I recommend keeping it between 1 and 2 most of the time. Increasing the value causes the sharpening to be spread over more pixels, resulting in thicker edges. Essentially, increasing this value will make the image appear sharper, but will very quickly result in halos and an oversharpened appearance. Detail– The detail slider controls the amount of sharpening of details in your image. As you increase it, smaller details in the image get sharpened. Increasing this slider will increase the sharpness of the image. Keep in mind that an increase in this slider will also accentuate any noise in the picture. Masking– The masking slider masks off solid areas of the image, which acts to avoid sharpening artifacts. It also avoids an increase of noise. If you have a noise problem or a picture with large spaces that need no sharpening, increase this slider. 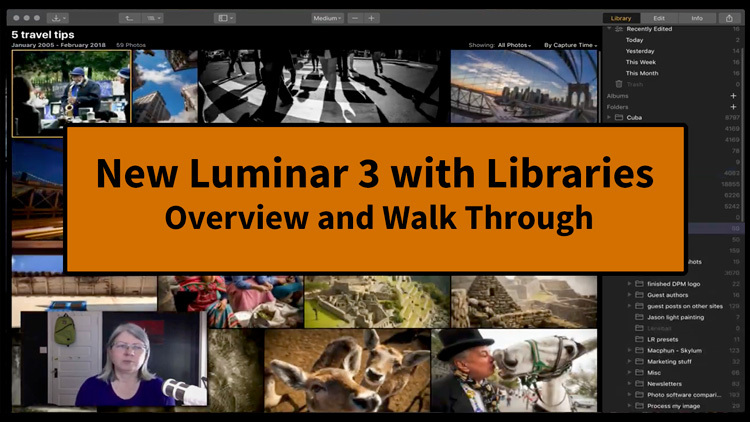 These tools become even more powerful when you learn to use Lightroom's tools for viewing the results of the sharpening you apply, which is what we will look at next. The panel above the sharpening sliders shows a detail of the image. You can also left-click on your actual image to see it at 100% so you can see the effects that way as well. Of course, you can also do both (zoom to 100% and view the detail panel). The best way to check your work is to you can press the Alt key (Option on a Mac) while adjusting the sharpness sliders. Doing so will cause the screen to turn grey and help show the effects of your sharpening. Working in this way will give you a lot more confidence when you sharpen your images. Amount: Pressing Alt while moving the Amount slider will show a simple grey-scale image of your photo. This just makes it easier to see the sharpening you are applying. Radius: Holding down Alt while moving the radius slider will show the edges you are sharpening. As you increase the radius, the edges will show up more clearly. Detail: Pressing Alt while adjusting detail will also show the edges you are sharpening. The details emerge as you push the slider toe the right. Masking: The masking slider looks much different than the others when you hold Alt while adjusting it. With no masking applied, everything will be while, but as you increase the masking more and more of the image will be black, meaning that sharpening is not applied. 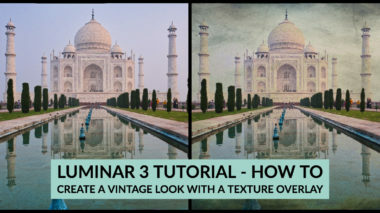 If you are going to spend some time sharpening your photo (i.e., doing something more than increasing the Amount to 50), I cannot recommend using this technique strongly enough. Pressing the Alt key while making your sharpening adjustments will make your sharpening much more effective and precise. While you are adding a baseline of sharpness to your images, there are a few other tools to use. The first is the Clarity slider. This does the same thing as sharpness, except that it applies to midtones. You will probably see more of a sharpening effect from this tool than from using the Sharpening slider. Increase it to about 10-15 as a starting point, and then adjust it to fit your picture. Lightroom has recently added another tool to make your pictures look a little sharper. It is called the Dehaze tool and it is all the way at the bottom of the Develop module. The Dehaze tool was designed to eliminate fog and haze from your pictures, so this is not something you are intended to use every day. At the same time, increasing the Dehaze slider a little bit will add clarity or crispness to your pictures. This is a new tool and I am still getting used to it, but I often find that increasing this to 10 make my pictures look a little sharper. It is important to remember that you are just applying a base level of sharpness to the entire image at this point. Don't worry about making particular details sharp (you will do that in the Creative Sharpening section). Sharpening and noise reduction often go hand in hand. In fact, they are frequently two sides of the same coin, in that an increase in sharpening will increase digital noise within the picture, and conversely an increase in noise reduction will reduce image sharpness. Therefore, you should pay attention to the noise in your image at the same time you are sharpening it. You can avoid the trade-off between sharpness and noise to a certain extent by using the Masking slider above. That will focus your sharpening to the edges within your image, which in turn will avoid sharpening of artifacts within solid areas of the picture. Beyond that, you will often need to apply noise reduction as well. Reducing noise is simple to do in Lightroom and it is quite effective. You just pull the Luminance slider, which is under the Noise Reduction heading, to the right. Noise Reduction is conveniently placed there so you can see the effects of the noise reduction and sharpening in the detail window. You can also press the Alt key (Option on a Mac) to see the changes without color, as you could with the sharpening tools. One of the great aspects of Lightroom is how easy it is to apply changes to multiple pictures at once. For simple Input Sharpening, this is a great. With multiple images selected, go to the Develop module and make changes to a picture. When you are done, press Sync. In the Synchronize Settings dialog box that comes up, make sure that Sharpening is checked. If you added Clarity and Dehaze, make sure those are checked as well. Now comes the part you've been waiting for, where you will make particular parts of your image sharp. Why do you want to do this? Well, it just looks better for one thing. But it also allows you to draw the viewer's eye to where you want it. People's eyes are attracted to sharper parts of the picture so sharpening gives you a certain degree of control over how people look at your images. 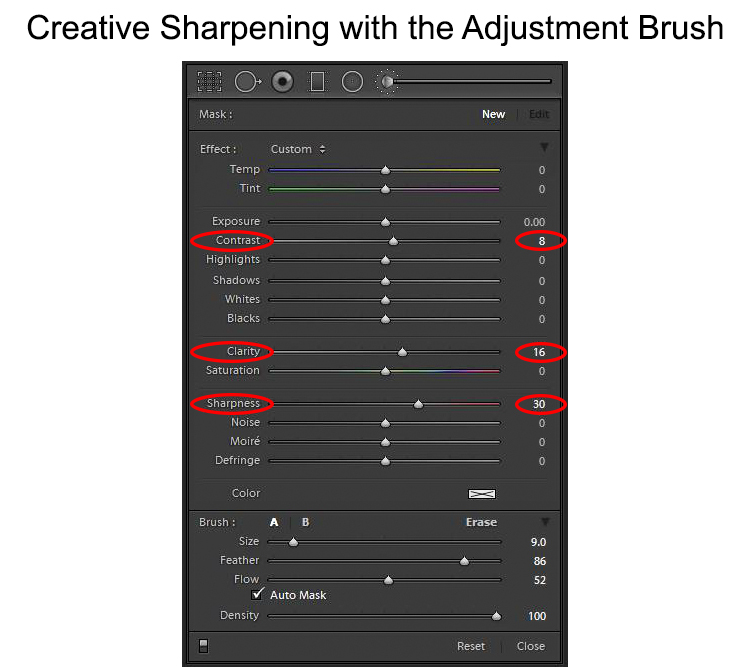 Creative sharpening is best done in Lightroom with the Adjustment Brush. Select the brush and then dial in the effects you want. Use the Contast, Clarity, and/or Sharpenss controls to make key parts of your image sharper. This is the creative phase of sharpening, so pay no heed to the values I used. Each picture will be different. As a starting point, go ahead and increase the Sharpness (start with an increase of +20) and Clarity (start with +12). You may also want to increase the Contrast slightly (try +5) as a slight contrast adjustment will also help make the image appear sharper. Keep in mind however, that this part of the process is called Creative Sharpening for a reason: it is where you do it your way. Every situation will be different, so there is very little I can give you in the way of guidance in terms of amounts. In any case, after you have set your values for the Adjustment brush, just paint in the effect. After you are done, you can change the Sharpness, Clarity, and Contrast settings within the Adjustment Brush panel to make the image look the way you want. Only apply this effect only to critical areas of the image. That typically is the subject and perhaps a few other crucial details. Don't apply it everywhere or your image will look oversharpened. This part of the sharpening process is 100% optional. It is also very dependent upon your individual image and tastes. Therefore, this is the part of the process I am writing the least about, but I don't want you to mistake that for a lack of importance. This is where you may spend the most time sharpening. The Input Sharpening was done by increasing the Amount to 55, while increasing the Radius to 1.5 and Details to 30. I set the Masking to 40 to keep from sharpening the sky as much. After that, I just wanted to add sharpness/clarity to the pier, so I used the Adjustment Brush with these settings: Clarity +35, Sharpness +55, and Contrast +19. When it is time to create a web version of the photo or a print, there is additional sharpening to do. This is called Output Sharpening and it will take you outside the Lightroom Develop module. Why would you do Output Sharpening? Because different display vehicles require more (or less) sharpness. An easy way to think about this is a web version of the print versus a print. For a web version, it will look pretty much like it already looks. You may give it a small dose of additional sharpening, but that will be it. A print, on the other hand, might require considerably more sharpening. Why? Because as fine tuned as the ink jets are, there is still a tiny bit of overlap between dots such that the image may appear a little bit soft in print. Adding more sharpening helps eliminate this effect. First, let's sharpen for the screen. I will assume you are making a JPEG file, since that is the file-type of almost all photos published online. To create a JPEG (or other file type for that matter), usually you will use the Export command (File > Export). When you do so, an Export dialog box will appear, and within that box you will have an option for Output Sharpening. 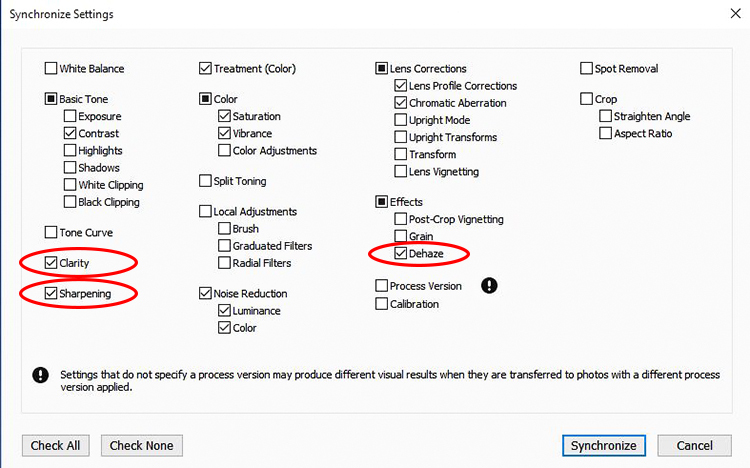 If you check the box, Lightroom will add sharpening based upon your final output. You choose between Screen, Matte Paper, and Glossy Paper. Choose Screen. After that, you choose Low, Standard, or High. Start by choosing High. If that is too much (and I don't think it will be), you can back it down to Standard. Now Lightroom adds a predetermined amount of sharpening to the image for final output. Be careful if you are uploading the file to a portfolio site (like SmugMug) as sometimes they also automatically apply additional sharpening to the image at upload. This can make your image appear oversharpened. Be sure to turn that off if you are applying these sharpening techniques in Lightroom. Finally, let's sharpen for a print. If you are not printing in Lightroom, but you want to apply Output Sharpening in Lightroom, just Export the file as you did in the previous section. You can export as a TIFF or PSD, among other options, and you can use the same controls in the Export dialog box to apply sharpening. That will apply the sharpening, and then you can print the file using other software. If you are printing within Lightroom, you apply Output Sharpening as part of that process. Take your picture into the Print module. In the print controls on the right hand side, scroll down to the Print Job category. Within that category, you will see a box for Print Sharpening. Check the box and it will give you options for output. Choose Matte or Glossy depending on what type of paper you are using. After that, choose Low, Standard, or High to determine the amount of sharpening to apply. Start by applying a High amount of sharpening, and adjust if it looks oversharpened to you. In this example, I wanted the Texas Longhorn to stand out. I first applied a pretty standard base level of sharpening (Amount +50) along with increases in Clarity and Dehaze of 10 each. After that, I used the Adjustment Brush 3 times. First, I used a mild amount on the entire cow (Sharpness +20, Clarity +8, Contrast +8). I then repeated these amounts on the face. Finally, I applied stronger amounts on the horns and eyes (Sharpness +25, Clarity +30, Contrast +12) to make them as sharp as possible. First, as part of your normal Lightroom editing, apply Input Sharpening to remove the inherent softness of RAW files. Use the Sharpening slider in the Develop module and set it to 50. While that move alone is frequently sufficient, there are other controls to allow you to fine-tune your sharpening. Don't forget to hold down the Alt key while making these changes so you can clearly see what you are doing. After that, apply a mild dose of Clarity and/or Dehaze to make the image even crisper. Remember at this stage you are just applying a base level of sharpness to the entire image so don't get carried away. For the second step you get to be creative and apply sharpening to particular parts of your image to make them stand out. Use the Adjustment Brush for this part of the process and increase the Sharpness, Clarity, and Contrast sliders so that you can brush these effects onto your picture. Spend some time here to make sure you get this part right. 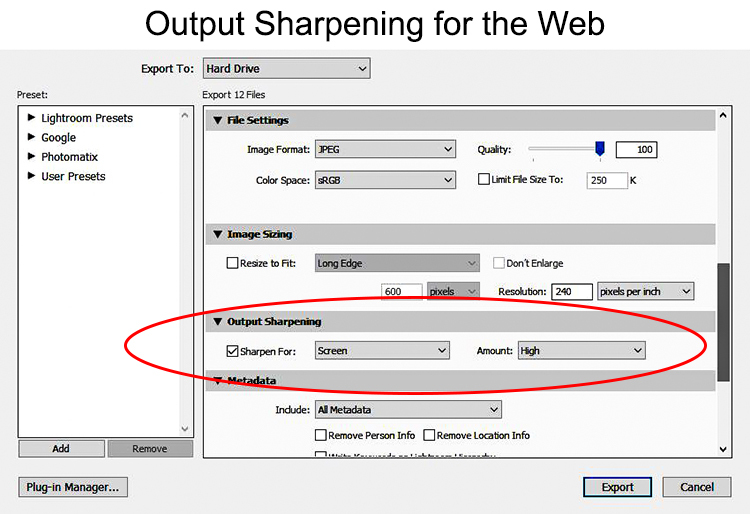 Last, when you are sending your file elsewhere for use as an online photo or print, apply Output Sharpening. Use either the Export command (to create a JPEG for display on the web) or in the Print module (to create a print). Just choose your output (Display, Matte paper, or Glossy paper) and then choose High. The process, when broken down into these steps, is pretty simple. More importantly, using this process you can have confidence that your pictures are as sharp as they can be. Jim Hamel shows aspiring photographers simple, practical steps for improving their photos. Check out his free photography guides and photography tutorials at Outdoor Photo Academy. The free tips, explanations, and video tutorials he provides are sure to take your photography to the next level.